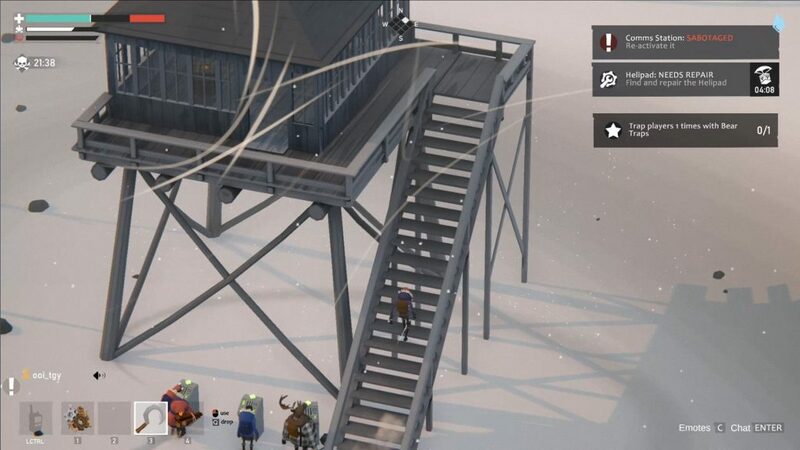 Project Winter is an eight-player social survival game that plunges players into the middle of a frozen wasteland. To survive starvation, cold, and hostile wildlife, players must work together to gather resources and repair the radio so they can call in a helicopter extraction. To make things more challenging, two traitors are among the group who must use charisma and subterfuge to ensure no survivor makes it on the helicopter. 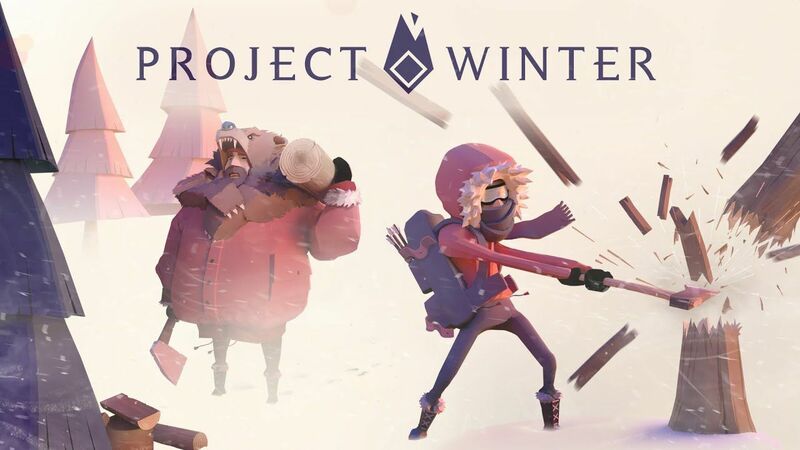 Project Winter is best described as a mix of the classic party game Mafia and survival video games. Matches run anywhere between 15-30 minutes depending on the players, so the survival mechanics are simplified compared to other survival titles. All players need to manage health, hunger, and heat. A large cabin is spawned in the middle of the map, and all other objective locations and wildlife spawn randomly around the map. The cabin offers the most reliable source of heat, crafting benches, and the radio needed to call in an extraction. Players can vote to exile suspected traitors from the cabin, making survival a further challenge. Survivors must work together to harvest resources, explore the map for bunkers containing crafting supplies, and repair objectives to call in the extraction. Opening bunkers and repairing objectives will require multiple survivors either pressing buttons at the same time or carrying multiple stacks of supplies to an objective. On the other hand, traitors must slow the survivor’s progression as much as they can and prevent as many survivors as possible from escaping. To do this, they must sabotage objectives and open traitor boxes that will provide high quality items that balances out the fact traitors are wildly outnumbered. Skilled traitors will spend much of the game doing their best to openly cooperate with survivors as they gather enough guns to kill off a survivor that has strayed away from the group or take control of the helicopter loading ramp. Players are awarded in-game currency at the end of each match based on the number of survivors who made it on the ship and how many objectives the player managed to complete. The social nature of the game means communication is a must. 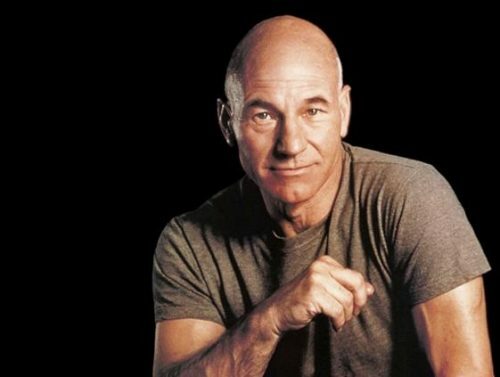 Survivors will need to organize themselves and point out possible traitors. Traitors need to coordinate between each other and do their best to shift the blame on innocent survivors or throw their partner under the bus. While text chat is possible in Project Winter, the game is clearly designed with microphones in mind. 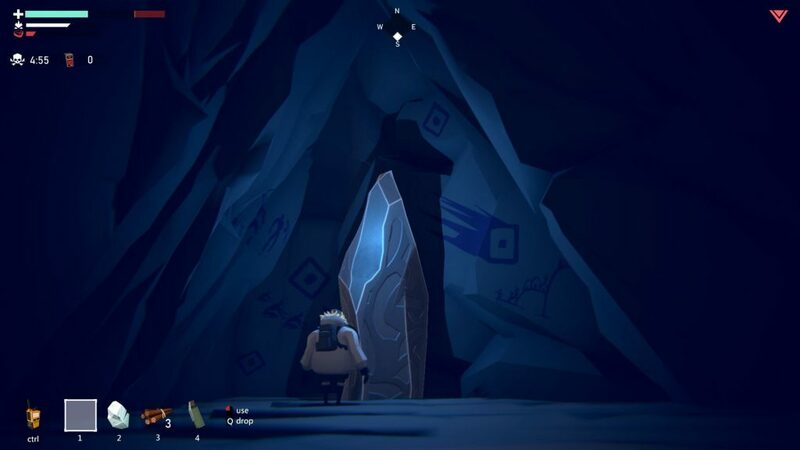 Local voice chat is directional, and colour coded radios are scattered in chests across the level. Traitors are issued a matching radio set right away, allowing them to coordinate their efforts in private. As the match progresses, the radios become risky as it could allow survivors to listen in on the traitors and vice versa. The controls are decent but can use a little bit of work. The game supports mouse and keyboard and controller set ups. I found the mouse and keyboard to be a little awkward at times. The UI only displays the default key bindings, so players who change their binds will need to memorize them. Picking up items off the ground can be a little tricky as the game is very fussy about player positioning. Project Winter’s audio/visual presentation is excellent. The sound effects and music are enjoyable. The positional voice chat is great, allowing sneaky players to eavesdrop at a slight distance and lost players to follow the direction of the voices to find the group. The game uses a simple but eye-catching 3D cartoon style that emphasizes the endless snow. Since the game does not have any character progression, players are given a variety of cosmetic items to customize their characters. 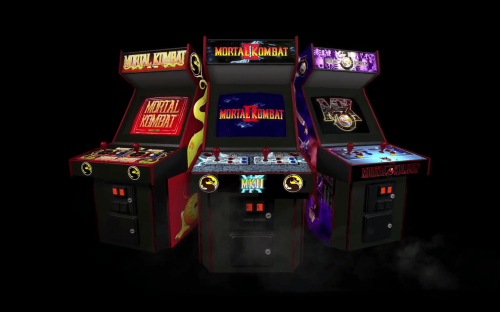 Players have access to a large colour palette to start with, but more distinct equipment must be purchased with in game currency after the player completes the required objectives. Alternatively, items can also be purchased on Steam Marketplace. The biggest challenge facing Project Winter is the game’s social nature. The problem is two-folds. On one hand, the game is at its best when players really get into the social aspect. Ideally, the game is best enjoyed with eight friends; however, wrangling that large of a group can be a logistical nightmare. On the other hand, public servers are heavily reliant on being lucky enough to find some dedicated players who are willing to communicate. The issue is compounded by the game’s price tag, which restricts the game’s player base. It’s hard to say what’s the best way to tackle the problem. One option would be to switch to a free to play model and make a better effort to monetize using the existing cosmetics system. Another option would be a semi free to play option, such as requiring the host to own the game. Finally, a shorter blitz mode involving less players may allow smaller groups of friends to enjoy the game. 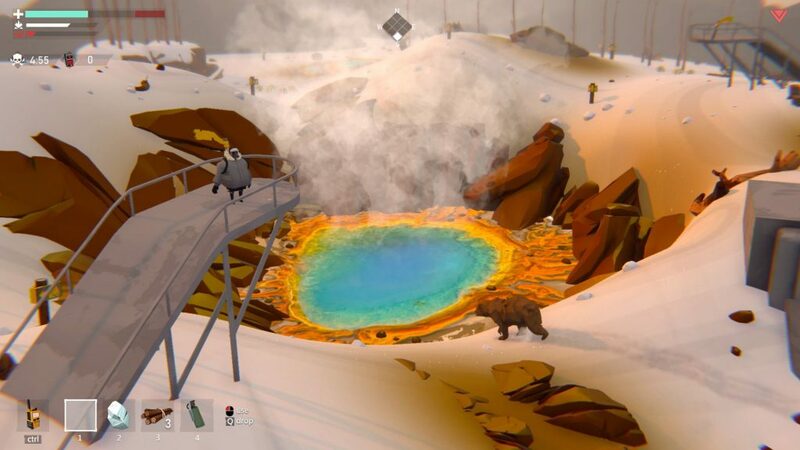 Gameplay wise, Project Winter is already a solid, casual social-survival game. There is room for improvement, as more content and better control, but the real challenge for Other Ocean isn’t technical in nature. No matter how good Project Winter is or will ever be, the game’s existence is inevitably tied to the size and quality of the player base. Other Ocean’s real challenge in the coming months is to figure out how to grow, nurture, and maintain that player base.